The following five questions will help sheet metal manufacturers assess whether robots should be used for bending operations. ■ Does the factory have an operator with rich experience and proficient in the computer to run the automatic bending unit? Some experts believe that having an automated bending unit work is to allow an experienced bending worker to accept robots instead of artificial processes because automation will inevitably lead to job cuts, which can lead to the collective exclusion of workers. The welding workers in the sheet metal factory have undergone a tortuous process from rejection to acceptance of the automatic welder, and the popularization of the automatic bending unit will undergo a similar transformation. There are also experts who believe that bending workers must discard the previous practice, that is, rely on the accumulation of small tips to manually produce high-quality parts and components but should input these tips into the bending programs to guide those unskilled workers or robots for automated production. Only skilled workers, with a willingness to open-minded and willing to use new technologies, can ensure that an automated unit is successful. However, the current software is quite mature, even if the first-line workers with little experience, can easily operate most advanced bending units. The time is gone to take a few days to teach a robot to do a few simple bending operations for bending mere 5,000 parts. 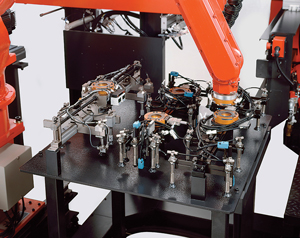 ■ What production tasks are best suited for using robots? First, the large volume and repetitive operation of the task, occupy a lot of time for the operators and resulting in tedious pain. Second, small batches, but frequently occurring tasks, as shown in the picture. It is not only a large batch of tasks suitable for the use of robot bends, small batches, recurring tasks are also suitable. Third, it takes two people to carry up the extra large parts of the material or may cause personal injury for the operator. My view is that if it does not exceed the working radius of the robot, and within the load range of the press brake production tasks are appropriate. The core of the automation unit is that a manual bender and an automated unit can be charged by an operator nearby. It is very meaningful for a worker to be able to do two bending tasks on both the manual and automatic bending units. Robotic bends require more time to set than manual bends, but it is also worthwhile because productivity is significantly increased. ■ How much time does it take to program? Almost all professionals admit that in the past few years, automated bending programming technology has made significant progress. It is not necessarily to understand the robot like engineering experts to program the automation unit. A programmer needs only a CAD module, after submitting the data, the software will generate the bend order and operation instructions. In some cases, people have to make a real bend test based on the recommendations, but software developers point out that such tests may be superfluous. Now the software program is embedded in 3-D simulation module, can simulate the robot and press brake movements, before the production instructions reach the machine, can simulate detection, and visually confirm the order of the bend. In addition, the software can generate instructions (see Figure 3) for choosing clamping tools (see Figure 2), robot motion and material end picker. 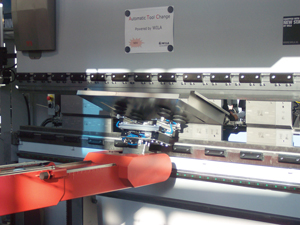 Robot bending machines can be quickly converted between different production tasks due to improvements such as automatic clamping tools replacement devices. In most cases, the programming can be done in the case of disconnection to ensure that the automatic bending unit is undisturbed. ■ What is the additional investment required in addition to capital equipment investment? You can’t talk about robot automation without leaving the security behind. The question concerns whether a sheet metal factory is willing to invest in a tangible fence, or a more open and secure grating to keep people safe. Two of investments are worth considering. A safety cover is the cheapest option, but it takes up a lot of space, which is not good for the layout of the workshop. 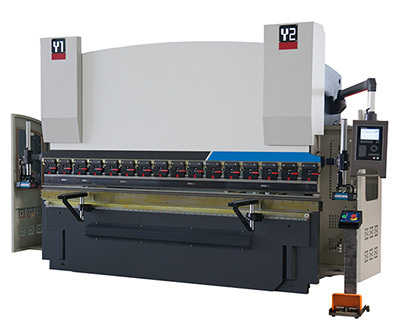 Take the bending unit of a major machine tool manufacturer, for example, it occupies an area of 12m long and 5m wide, including a feeder robot, but does not include space to accommodate the security fence. For a cramped production workshop, automated production with security guarantees is difficult to achieve. For workers who are interested in safety gratings, note that the Automation unit may stop working in unexpected situations. The problem with the safety grating is not that it should not be used, but that most people do not know where the boundaries are, that some people simply have no intention of waving their hands through the workshop, without knowingly triggering the light of the safety grating, thus closing the bending unit. However, safety gratings are suitable for use in relatively open workshops and are more suitable for companies that strictly restrict the entry of people into the workshop and clearly label the boundaries of the production unit. 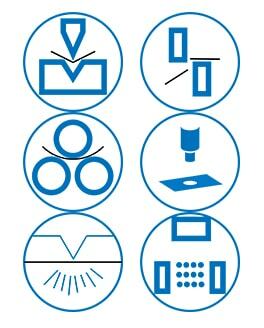 Investment in quick-change clamping tools has been mentioned before, and the next step behind this investment is to add an investment in the newly emerging automated mold library, as shown in Figure 4. In the latest generation of the automatic bending unit, the mold can be installed and downloaded according to program instructions, do not need to be manually installed. 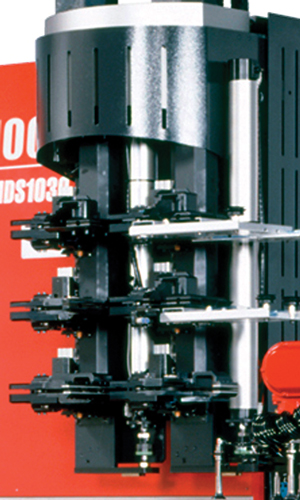 After the program is programmed, the mold library is automatically installed and unloaded in the upper and lower die replacement device, which has a rotating disc that carries the mold, adjusts the mold to a suitable position, and installs it to one of the top and bottom two clamping devices. ■ How to determine the reasonable cost of a robot? 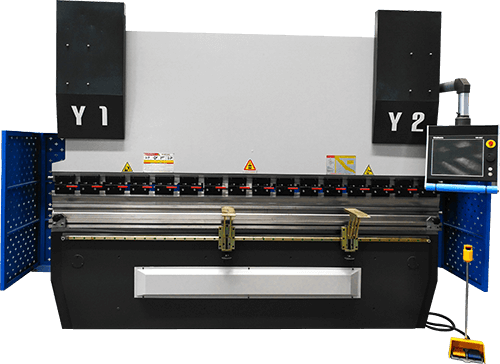 This depends primarily on the effective working time of the press brake, which will help assess whether it should be purchased. When you can have an operator take care of two bending machines at the same time, the productivity improvement is very obvious. But investors should pay more attention to the utilization of equipment. If the automatic press brake always shut down, other than the continuous production of parts, then it will not continue to create a return on investment. To improve device utilization, a company should improve all aspects of the automation unit. In many practices, the time to set the preparation is as much as the time of production and fabrication. What is the point of an automated unit that does not match a quick-change device? Compared with the traditional two-axis back gauge, how much faster can the components of a six-axis back gauge be produced on the automation unit? If every process is not very smooth, then enhance the efficiency of a single process is meaningless. It is, of course, necessary to think about the length of the production cycle, but in many practices shortening the cycle of production is not as effective as increasing the number of components in one shift or one day. 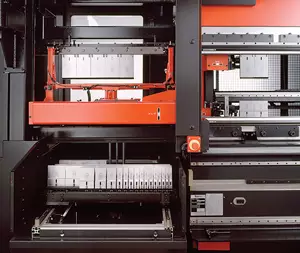 The key to the problem is to reduce the standby time of the press brake so that it can be in working condition for a long time to increase the production significantly.